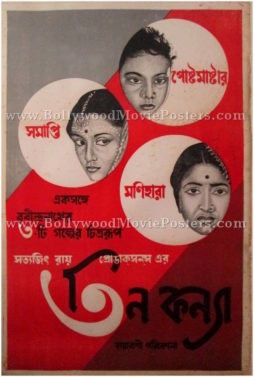 Extremely rare vintage Satyajit Ray movie poster of one of the finest films ever made in Bengali cinema, Teen Kanya (1961) for sale. Written and directed by master filmmaker Satyajit Ray, Teen Kanya is a compilation of three short stories authored by Rabindranath Tagore. The film starred Soumitra Chatterjee & Aparna Sen in lead roles. Teen Kanya won the 1961 National Film Award for Best Feature Film in Bengali, making this rare Satyajit Ray movie poster highly collectible! Teen Kanya bagged the Selznick Golden Laurel for Best Film at the 13th Berlin International Film Festival. The critical acclaim and success of the film led the Academy Film Archive to preserve it in 1996.